HP Business Process Testing in a nut shell is used for designing business components that can be reused in business process tests. Pre- requisite : A separate add-in which comes along with Quality Centre. Scripted Components are regular code driven components. Component Input and Output Parameters - Variable values to and from a business component. Create function libraries that contain functions, or operations/keywords that can be called by a component. You can create multiple application areas , each one focusing on a particular part of the application. Used by: Business process tests that include the currently selected business component. Component Requests pane: Handle new component requests that were generated in the Test Plan module. 3. 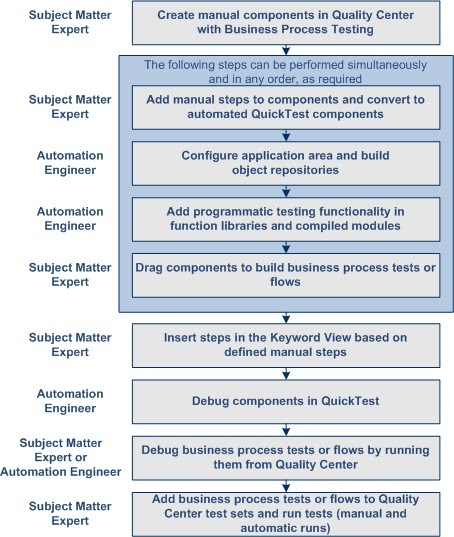 Creating Business Process Tests and Flows in the Quality Center Test Plan Module SME creates a business process test or flow in the Test Plan module by dragging and dropping required components. Eliminates the need of creating a separate framework for the Automation.